I picked up James Van Pelt’s first short fiction collection, Strangers and Beggars, way back in 2002 at World Fantasy Con in Minneapolis. Even then I was impressed at how much power he could pack into a few thousand words. His latest collection, The Radio Magician and Other Stories [Amazon | Mysterious Galaxy], is even better. It’s easy for fiction to become formulaic: Protagonist wants X. Protagonist tries to achieve X by doing Y. S/he fails, tries again, fails again, tries a third time, and either wins or loses it all in the climax of the story. It’s a perfectly serviceable formula, one which produces perfectly serviceable fiction. Van Pelt does so much more. In “Where Did You Come From, Where Did You Go?” our protagonist and her friend don’t stop the bad guy. They’re not active characters at all, being mere observers to the SFnal drama unfolding in their classroom. Yet it’s still a tense, gripping story. And the ending, in which they learn the truth and are left with one terrifying and unanswerable question, has more impact than many full-length novels ever achieve. “The Inn at Mount Either” packs a similar punch, making the SF idea more central to the story as our protagonist explores a resort situated at the intersection of parallel universes. Van Pelt doesn’t give us the easy ending another author might have written; he adds one more page, turning an interesting story into a full-strength gut punch. He’s also playing with fascinating ideas. What if artificial intelligence was not only possible, but became so cheap that everything could have AI chips? What if space exploration could be outsourced, not to private companies, but through children’s collectible toys? (Gotta find ’em all!) What if the universe were ending, and all that remained were two sentient machines orbiting a star? Like any collection, some stories worked better for me than others. I wasn’t as fond of “Of Late I’ve Dreamt of Venus,” mostly because I didn’t feel as connected to the characters. “One Day, in the Middle of the Night” was an interesting premise, but I felt like Van Pelt was working too hard to fit the gimmick of the story. But these were the exceptions, and even with these stories, I was still impressed by the ambition, the purpose and power of Van Pelt’s writing. Let me put it this way: reading this book made me completely rethink the potential of the short story, and the things I want to accomplish the next time I sit down to write one. The notes on my ARC say the book comes out in September, though Amazon lists it as already available. I definitely recommend this one, both as a reader and a writer. And while you’re at it, check out James Van Pelt’s home page, or go visit him on LiveJournal at jimvanpelt. It was early 2004. I had just signed a deal with Five Star to publish Goblin Quest. This would be my first published fantasy novel, hopefully bringing me one step closer to actually Making It As A Writer. With Five Star being a small specialty press, I was on my own when it came to blurbs. So I e-mailed a few people I knew. On a whim, after reading one of Wheaton’s blog columns about gaming, I wrote him a quick e-mail. Not only did he read it, he provided my favorite blurb ever, calling Goblin Quest “Too f***ing cool for words!” He also hooked me up with John Kovalic, who went on to provide another blurb. It’s hard to put into words how much that meant. I was a nobody in the writing world. I had friends signing deals with major publishers, and I was with a press that might sell 500 copies if I was lucky. I felt like a fraud, and I was terrified people were going to find out. Having Wil Wheaton agree to read the book, and his follow-up e-mails saying how much he enjoyed it … well, it didn’t make the crazy go away, but it helped. It helped a lot. So now it’s five years later, and I finally got my hands on Wil’s book Just a Geek [Amazon | Mysterious Galaxy], a collection of blog posts and original material chronicling Wil’s decision to leave Star Trek, his efforts to find work in Hollywood, the struggle to balance career and family, and his eventual decision to give this writing thing a try. The hundreds of adoring fans I’d hoped to see did show up . . . when people like Kevin Smith and the cast of the short-lived Witchblade took up temporary residence at tables near mine. I would often be one of the final two or three actors to be considered. But consistently coming in second or third was actually worse than not making it past the first round of meetings. It was like scaling Mount Everest, only to die within sight of the summit . . . over and over again. I think every writer goes through this stage, where we’re getting “Almost, but not quite” rejections and going bugnut insane trying to figure out why we can’t make the cut when we’re so freaking close. The point is, it’s an aptly-named book. There’s a blunt honestly to the writing. You don’t feel like you’re reading about a celebrity; you’re reading about a guy who, like most of the folks reading this review, is just a geek (albeit one with 10,000 times as many Twitter followers as most of us). If writing is about creating a connection between author and reader, then Wheaton is a damn good writer. If you’ve read his blog, you know Wil Wheaton can write. 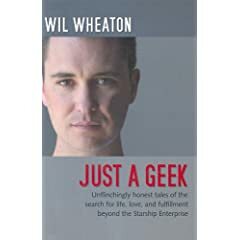 Just a Geek shows he can do it at book-length, tying individual stories and blog entries together into a larger story, one which starts with Wil Wheaton trying to Prove to Everyone That Quitting Star Trek Wasn’t A Mistake, and ending with Wil Wheaton, Author. The book comes out in paperback at the end of this week. Check it out. I started reading Rob St. Martin‘s Truthseekers: Welcome to Blackriver [Amazon | Mysterious Galaxy] on the drive back from vacation. I finished it fairly quickly, and immediately jumped back into revision madness, so it’s taken me almost a month to actually post a review. Bad Jim. This first Truthseekers volume is a collection of intertwined short stories centering around fifteen-year-old Ashley Bennett. When Ashley’s parents are murdered, she has to leave Toronto and move to the small town of Blackriver to live with her older cousin Mark. Over the course of the book, Ashley begins to uncover secrets about her parents, her cousin, and herself. It’s a fun, easy read aimed at a YA audience. (I enjoyed it too, but there are those who’ll argue whether I qualify as a grown-up.) Ashley’s secret is a fascinating one. I saw it coming, but that doesn’t matter; I still like the implications about what she is and what she can do. I liked the format overall. It was nice to be able to read in bite-sized chunks, advancing through the larger story one self-contained adventure at a time. Though there were a few times I’d start in on the next story and think to myself, Wait, why aren’t you guys doing more about X from the last story? I only had two complaints. The first was that some of the stories started slowly. There’s a pattern of following Ashley through some of the mundane aspects of her life before we get into the weirdness. I can appreciate the contrast, but after a few stories, I found myself wanting to skip the first few pages and jump ahead. The second issue was with the ending. I didn’t expect the book to wrap up every single loose thread, but I find it ironic that while the individual stories are self-contained, the book as a whole leaves you hanging. Though perhaps that’s a good reason to mention that Truthseekers 2: Birthright [Amazon | Mysterious Galaxy] is also available? Every time I try to figure out how to wrap up this review, I keep coming back to the fact that it’s a fun read. Likeable characters, a good balance between the serious and the not-so-much, and an overall arc that has me curious about book two. Rob is also on LiveJournal as Talyesin, and has posted the first chapter of the book at http://talyesin.livejournal.com/501876.html Check it out. Amy and I snuck out yesterday to see Transformers 2 while the kids were at their cousins’ place. (Please note – this was Amy’s suggestion, not mine. Because my wife is that cool.) Currently, the movie is getting trashed in the reviews. 21% at Rotten Tomatoes as of this morning. But you know what? I liked it. It’s silly, over-the-top, with problems ranging from a cartoon plot to Prime’s face fetish, but like the first movie, that’s not the point. You go in with low expectations, turn off your brain, and enjoy the spectacle of giant robots pounding the crap out of each other. I thought some things worked better this time around. It was nice to actually get some personality from Starscream. On the other hand, sometimes Michael Bay’s idea of “personality” is problematic in the extreme. Next up: the spoilers, including points that worked and didn’t, and a deeper look at Mudflap and Skids. A while back I finished reading Nightmare [Amazon | Mysterious Galaxy], by Steven Harper. 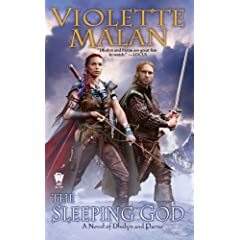 This is the second book in Harper’s Silent Empire series, in which certain individuals known as Silent have the ability to enter The Dream, a kind of telepathic linking of sentient minds. The Dream provides instant communication between the stars, and as a result the Silent are highly valued. It’s been a while since I read Dreamer, the first book in the series. So it threw me a little to realize this book jumped backward chronologically, exploring the backstory of Kendi Weaver. It’s not a nice backstory. Kendi’s family is captured by slavers and separated. Kendi is discovered to be silent, which makes him far more valuable. Kendi is eventually freed, and finds himself drawn into a mystery surrounding a killer who murders people within the Dream. There’s a lot going on in this book. The murder mystery is well done, though the ending has a strong element of coincidence to it regarding the whereabouts of our killer. (Is that vague enough?) The story of Kendi’s enslavement felt … hm. It didn’t feel like a slave narrative. I could empathize with Kendi’s pain, but at the same time, a part of me was thinking “This isn’t anywhere near as bad as it could be.” Whether or not that’s a good thing depends on how painful you want your slave stories, I guess. I thought it worked well for the story, since the book is about Kendi’s growth rather than any particular phase of his life. I also liked the way Harper handled Kendi’s sexuality. It’s hard enough coming to terms with those adolescent drives and feelings. Try being a gay slave trying to sort it all out. Kendi’s crushes and his struggles to accept himself worked well. Not preachy, and not the core of the story, but a part of his life that most readers will be able to relate to. As for the Dream, that’s just nifty. Communal telepathic reality. How cool is that? I loved watching Kendi and his friends learning to explore the Dream, as well as the history of the Children of Irfan (a Silent group), and all the different implications of Silent communication. All in all, I’d definitely be interested in reading book three in the series to see where Harper goes with it. 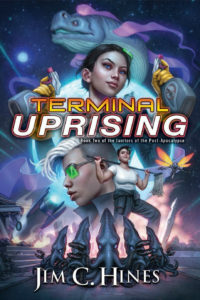 So, anyone else read this book or the series? What did you think?